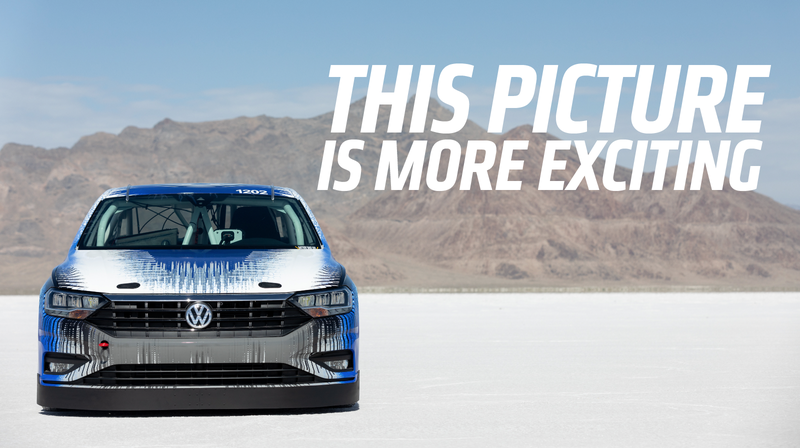 The other day we told you about how Volkswagen broke a very specific land speed record in their very modified Jetta at the Bonneville Salt Flats. What we didn’t show you then was the in-car video of the event, and when you see it now you’ll understand why: it’s possibly the most boring speed record video you’ve ever seen. Now you’re excited to watch it, right? I hope you like the gut-wrenching thrill of watching numbers occasionally increment, all set to the sound of what could be a nearby lawnmower! Here you go! Were you uncertain if you actually hit play? That’s understandable. It’s a speed record video that’s almost exactly the same as a still image. That’s something special right there. Really, it’s not VW’s fault; I was there when they set the record, and I drove on the salt flats, and, let me tell you, there is no way to tell just how the hell fast you’re going out there. There’s no visual frames of reference; it’s all just the white void of the flats, with some mountains hovering in the background. If it wasn’t for the cones placed on the course, you’d have no idea how fast you were going at all. That’s exactly what we’re seeing, or, really, not seeing in this video: the vast expanse of white salt flats looks pretty much the same at 0 mph as it does at 210 mph. And that, adorable readers, is a recipe for a really boring speed record video. I looked through all the assets VW sent along to see if there was a video of the car running the lap from the outside, which would have been a lot better.